[Dave Birch] Well, that was a little bit different. 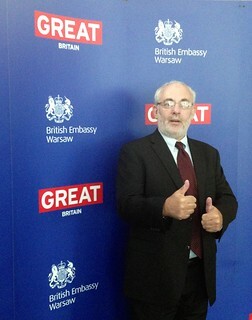 I went off to the British Embassy in Warsaw to take part in Chris Skinner’s Financial Services Club Poland evening. Chris had put together a terrific programme and was rewarded by an equally terrific turnout for the event. An audience including senior bankers and a member of Parliament were met by our woman in Warsaw, the Deputy Head of Mission Gill Atkinson. Gill was an excellent host, and got the proceedings off on exactly the right note, talking about the economic relationship between the UK and Poland and suggesting that British companies spend a little more time and effort in Poland to explore the opportunities there. Before it got started, Michal Panowicz, the Director of the “mBank” initiative at Bre Bank, gave us a demo of their just-launched online banking portal, which was very impressive. Unfortunately, in order to get it to work, he need web access and there was no wifi inside the Embassy. 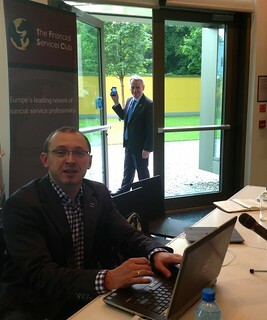 We couldn’t get a mobile signal either because the Embassy windows are coated in some kind of anti-spy material, so we opened up the emergency exit and had Chris hold his phone outside and used it to create a hot spot. I expect this is, strictly speaking, treason, so mum’s the word. I spoke about the outlook for mobile wallets in the short- to medium-term and I said, essentially, that retailers were in the driving seat and that banks should build strategies around the “triple-A play” of authentication, apps and APIs. I was exploring the idea of the wallet as an infrastructure rather than the wallet as an application. I got some great questions in the Q&A and very much enjoyed learning about the Polish experiences with mobile, contactless, NFC and online financial services. There are something like 5,000 users of T-Mobile’s “MyWallet” NFC service which earlier this year was extended to include Getin Bank and Nobile Bank as well as Polbank and mBank but I didn’t get a sense of how much they are used. There’s an Orange and mBank solution as well but I don’t know how many users it has. I used contactless to pay in my taxi (hurrah!) and at the coffee shop I went to so I can say that in Warsaw at least the acquiring infrastructure is visible. I was followed by Jakub Gorka, from the University of Warsaw, who gave a much better and much more interesting talk about the differences between the UK and Poland when it comes to cash in circulation, POS density and other such numbers of great interest to obsessives such as me. One of the key figures that he showed was the amount of cash in circulation per head of population, which in the UK is double what it is in Poland. The audience were puzzled as to why the average Brit would have a thousand quid under the bed when they have a much greater POS density to hand. I reassured them that the average Brit actually had very few quid under the bed and that the figure was greatly distorted by the extensive use of cash by criminals, tax evaders, corrupt lobbyists and drug dealers. We then moved on to a fascinating and detailed discussion about the level of interchange rates in Poland and their impact on the industry structure. I didn’t get a chance to ask Jakub about the future of the the Polish one zloty coin though. It is currently worth three times its face value as scrap. Yet most of the coins end up in cookie jars and piggy banks. The central bank estimates it could save about 40 million zlotys ($12.9 million) a year on producing and servicing about 7 billion of the coins, which make up for over a half of the 13 billion coins in circulation in Poland. I got a couple of these in my change so I’ve put them to one side and when I’ve got a few thousand more I’ll pop round to the scrapyard and cash in.